The present investigation examined the role of multiple close relationships (mother, father, best friend, and romantic partner, if any) in happiness among emerging adults with and without a romantic partner. The results for those without a partner (n = 152) revealed that only the relationship experiences with mother and best friend were predictive of happiness. On the other hand, the findings for those with a partner (n = 159) showed that only three factors, namely mother–child relationship quality, romantic relationship quality and conflict were predictive of happiness. 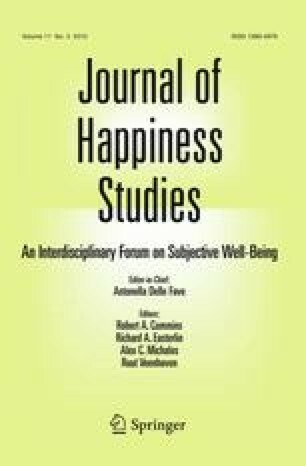 The results for this group also suggested that romantic relationship quality was protective of best friendship conflict; moreover, best friendship quality did not buffer the negative impact of romantic partner conflict on happiness, suggesting a less important role of best friends in happiness. In other words, the findings suggest that when emerging adults are involved in a romantic relationship, friends’ importance in happiness might be less pronounced or not pronounced at all. The results were discussed in light of the literature and suggestions were made for future research. The author is appreciative of the comments of the anonymous reviewers. The author is also grateful to Adilşah Demir, Metin Őzdemir and Őzgür Parlak for their helpful comments while preparing the manuscript.